Attendees of Loving Garland Green's June 16th meeting - Every Monday 6:30 to 7:30 PM at 216 East Kingsbridge Drive 75040. Loving Garland Green is a nonprofit organization and our meetings and membership are open to the public. Last night the members took a vote and we decided to devote the last Monday of each month entirely to discussions and presentations of garden topics--no business. We are not opposed to folks bringing homemade snacks from their gardens and kitchens to share with the attendees. Monday, June 30th will be devoted to discussions of methods of organic pest control. We are inviting members and guests to bring samples (or a sample) of their own special pest remedy. Names will be put into a flower pot and at the end of the meeting they will be drawn and the remedies will be given out to the winners. In addition, if you bring a concoction, please bring about 25 copies of the recipe for discribution. Below is a photo of the giveaway organic pest control I'm bringing. It is a can with both ends cut out of it. It comes with no guarantees. However, it represents my last-ditch effort to successfully grow squash. To date all the squash I've planted grows into great vines with lovely flowers. Then one morning I go to inspect my garden and the vine is withering. I inspect closer to where the stem goes into the earth and I see the stem has a big hole in it. From my childhood I remember my grandmother putting tin cans around her plants when they were young to prevent worms from eating the stems. She did it with her squash as well as her tomato plants. For me, knock on wood, bugs don't bother my tomatoes--only the squash. Ever "the scientist", I've set up an experiment in one of my garden beds. 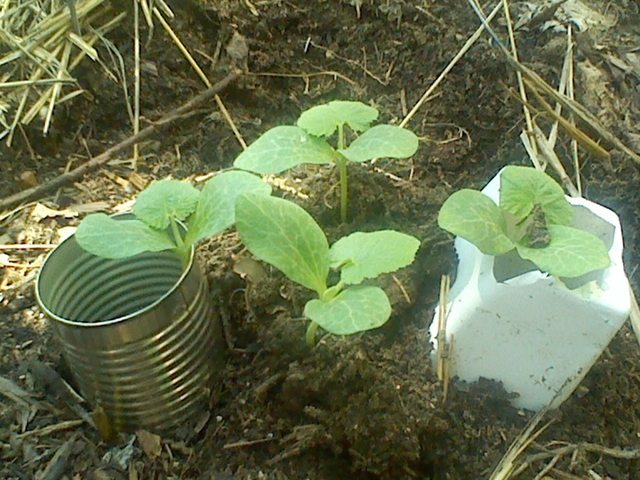 One squash plant with a tin can, one with a plastic plant container and two I've done nothing to. I'll keep you posted on the developments. In the meantime, if you want to learn about other methods of organica pest control, attend the Monday, June 30th meeting of Loving Garland Green from 6:30 to 7:30 at 216 East Kingsbridge Drive 75040. Who knows what you might learn? 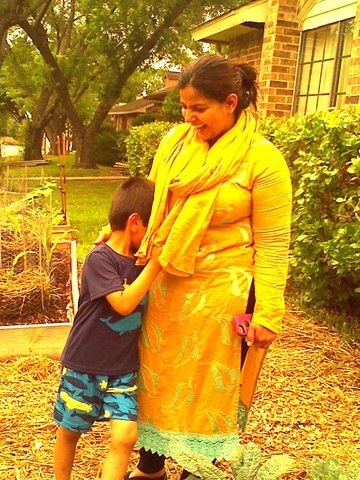 Five-year-old Abu was camera shy and tried to hide behind his mom, Nighat Ghakhar--but he was not garden shy. He is the one who wanted to go on the garden tour and excitedly took radish seeds at my house, a cucumber at Gene and Margie's and tomatoes as well as seeds at Charlie's place. One thing's for certain, children are among the most enthusiastic supporters of gardening. Perhaps it's because they are still young enough to appreciate the miracle of a seed. Myself, as an old adult, must be reminded of this phenomenon once in a while in order to feel the awe. A few days ago when Charlie was carefully preparing seed packets for visitors to his garden, I had one of those moments in which I remembered just how special seeds are. If you've ever seen a Brussels Sprout seed, or a Broccoli seed, you'll know what I mean. Here they are: teeny specks--so teeny that if you drop them on your kitchen floor, don't hope to find them again (especially my kitchen floor). Yet, in spite of their size, they come fully programmed to grow into enormous plants. Some of Charlie's Brussels Sprout stalks stood five feet tall this year--all from one teeny seed. How does all this information get stored in a seed? If a human were building the seed, just think how big it would have to be to contain enough computer chips to store all that information for one plant. How does a Brussels Sprout seed know to grow into a Brussels Sprout plant and not an Okra plant. To contemplate the seed is to contemplate the infinite and the miracle of creation itself. I think the child's mind is still uncrowded enough to appreciate the miracle of the seed and that may be one of the reasons they seem to love the garden even more than adults. It could be their unbridled joy at picking the food and eating it right from the garden (a joy that even most adults share with children). I thought about all this as I watched the children who visited my garden on Saturday. 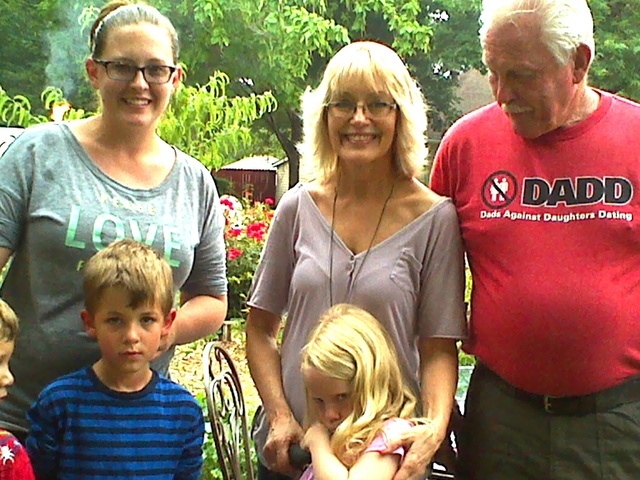 Above we have Candi Reindl and her two sons along wih Joan and John Baer with their granddaughter, Autumn. The children frolicked in the garden and found a few blueberries to eat. Joan and John are currently in the process of building their own urban garden. Of course, as with all the visitors to my garden, I invited them to join Loving Garland Green. That's another thing about gardens--the urgency of time slows down. Sometimes when I'm out in my garden I'm shocked to go in the house and realize that several hours have passed. Sue Holmes-Watkins who writes for the Dallas Morning News stopped by and we had a nice chat. I've read many of Sue's articles but never had the opportunity to meet her until the garden tour. Turns out that her family are among the original families here in Garland and she went to school with Monroe Todd whom I've written about before here on my Eat Green blog. The conversation moved in that direction when mentioned that I was surprised to learn that Sachse is older than Garland (founded in 1891). A few days ago when Charlie and I were driving through Sachse to go to Lake Lavon to watch a sunset, I happened to notice a saying noting Sachse's foundation in 1845--forty-six years earlier. It's interesting to me how/why some communities grow into large urban areas and others stay small. As we were chatting, Melissa Vernon pulled up on her bicycle. Turns out that Melissa's forebears were also among the early settlers of Garland. Sue and Melissa joked that they were probably related somewhere down the line. Gardens bring people and neighborhoods together--especially gardens that are in the front yard. Until I put my garden in my front yard last June 2013, I doubt that in the 10 years that I've lived here any more than five people stopped to talk with me when I was out in the front yard. I started keeping track of the people who began stopping on June 15, 2013 and kept track until about the middle of August when I stopped counting at 95 visitors. If you are lonely, one great cure is to start digging up your front lawn and putting in a garden. I guarantee that you will have more than enough people to talk with. But if you really want to talk garden, come to a Loving Garland Green meeting. We meet every Monday 6:30 to 7:30 PM at 216 East Kingsbridge Drive (the part of Kingsbridge that is close to Naaman School Road). My home is only four houses up from Naaman School Road. 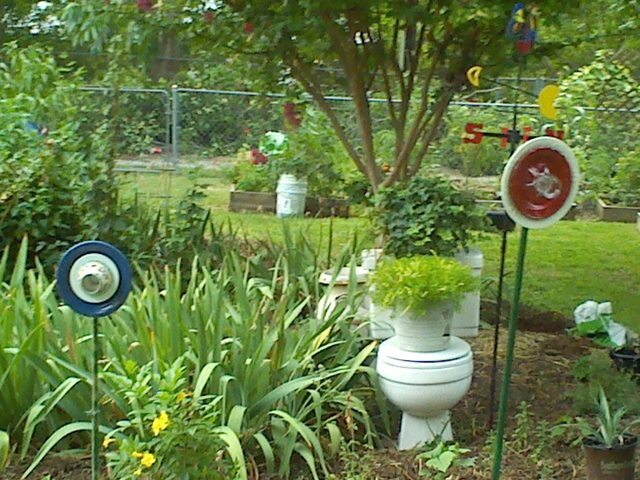 A view from Margie and Gene's garden featuring dinner plate flowers and a toilet planter. 1. Toilet recycling programs crush porcelain and use in concrete for roads and sidewalks. Check with your city to see if they have a recycling program that includes toilets. 2. Habitat for Humanity has stores in the USA and Canada called Habitat ReStores. These retail centers sell new and gently used household goods and use the proceeds for local building projects. We appreciate you all and hope you will continue to grow our local economy by growing more of the food you eat. In the fall we are planning another garden tour which is likely to be in mid to late October as the Autumnal Equinox for 2014 falls on September 23. Likely this day will be a bit early for our fall harvests, but we will see. As always, you are invited to join Loving Garland Green. We meet every Monday at 216 East Kingsbridge Drive Garland Texas 75040 from 6:30 to 7:30PM. 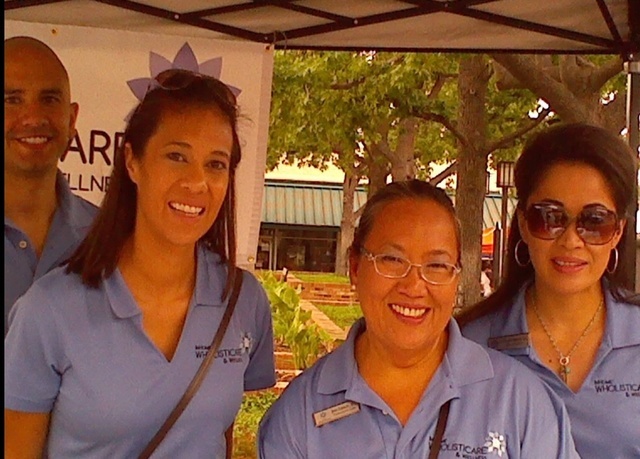 Yesterday was not only the Summer Solstice, it was the third Saturday of the month and thus The Garland Marketplace! There were at least twice as many food vendors at Saturday's event as there were the last time I visited. I'm very excited about this as the best way to build a healthy local economy is to move in the direction of a local plant-based economy. The more people who grow plants locally, the more stable and prosperous our local economy will become and the less we will be affected by national and international economic recessions that have become the rule and not the exception for the lives of all Americans. Charlie Bevilacqua, a member of the board of directors for Loving Garland Green went with me. One of the first stops Charlie and I made was to say hello to Kirk Lovett. Kirk is the man whose marketing firm heads up the efforts to put the Garland Marketplace together once a month. 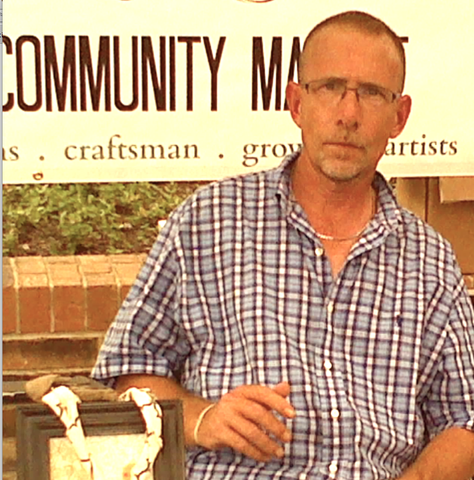 This is the second year for the monthly marketplace on the square. In a rare moment I snapped a photo of Kirk sitting down. Part of the proceeds that Kirk takes in from the vendors goes to The Good Samaritans, a nonprofit organization here in Garland. This group is dedicated to preventing homelessness and hunger among the working poor. We also stopped and chatted with Anita Goebel, the council member representing the downtown area of Garland. All our council members and Mayor Athas have supported the efforts to get a marketplace in downtown Garland, but I know that Anita has worked tirelessly in making this event happen for the citizens of Garland. In addition, she continues to support it well. I've never been to the market without seeing her there. Special Note to my readers: I was in a hurry when I visited the marketplace as there was also a wedding and the Midsummer Nights Garden tour on my schedule for this day. Please write to me at eebemma@yahoo.com if I got any names or phone numbers incorrect and also to add any additional information. All these people are too important to the prosperity of our local community and its economy to get any information about them wrong. The following vendors are among those whom I know have appeared at the Garland Marketplace at least once. Some, like the Ragsdales, haven't missed a time since the marketplace opened up last year. 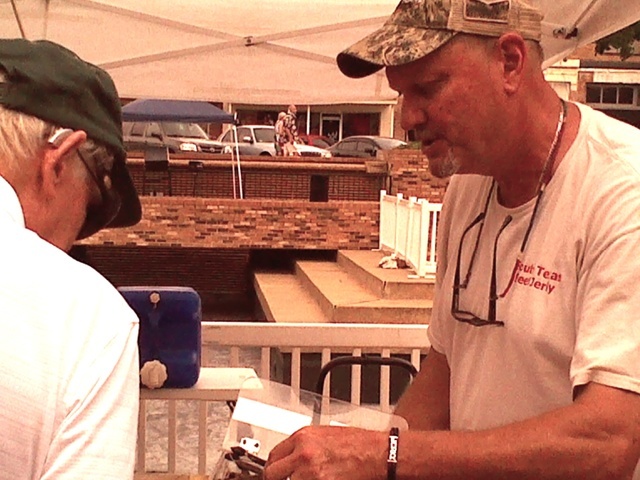 My friends Paul and Zach Ragsdale from Ragsdale Farms were there and I had a chance for a brief chat with them. 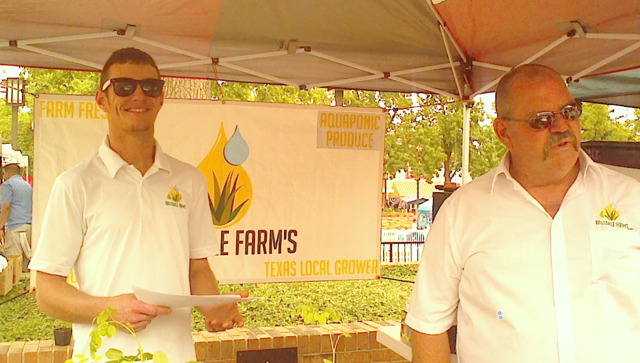 Ragsdale Farms is located in Caddo Mills and they sell aquaponic produce, fresh farm eggs, mesquite wood and Moringa trees. Sounds like Zach is moving closer to commercial production of his Moringa Oleifera health products. The Moringa is tropical plant said to have over 46 antioxidants and 92 nutrients. It also contains 36 anti-inflammatory and over 20 amino acids. Moringa leaves also contain vitamins A, B1, B2, B3, B6, B7, C, D, E and K, Moringa has many medicinal uses and has been used to treat conditions such arthritis, rheumatism, anemia, cancer, diabetes, epilepsy and stomach complications such as spasms, ulcers, stomach pain and constipation. It is said that Moringa can also help to boost the immune system. Zach grows Moringa trees at the farm and he sells them at the Garland marketplace. Go there in July and you can buy one. The Ragsdales are great with children too. Give them a holler and schedule a tour for your Girl Scout or Boy Scout troop. Give them the opportunity to see a real working farm with ducks and chickens. Get Paul started on the topic of chickens and he will talk your leg off. Last month I purchased a delicious banana nut bread loaf from Suzanne Matthews of Granny's Gourmet so I stopped by to chat briefly with her on Saturday. Business is going great. 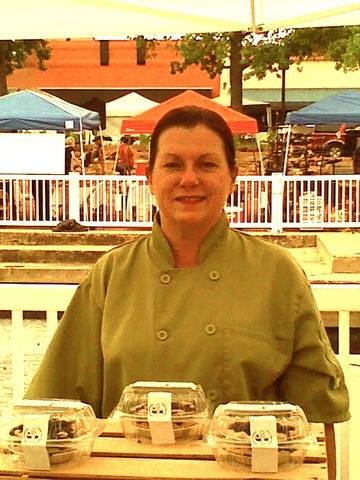 If you want to order something delicious from this Mesquite TX bakery, give Suzanne a call at 214-809-9984. If you have a sweet tooth, you won't regret it. 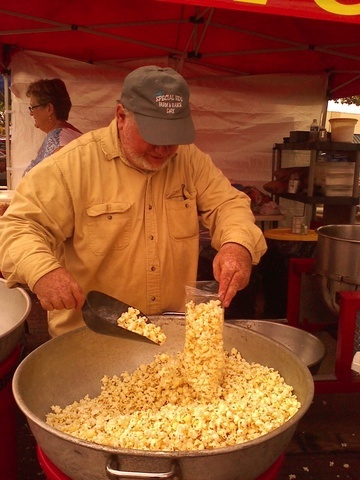 Tom Whitley scooping up some of his delicious popcorn for Charlie and Liz. Charlie and I took shameful advantage of Thomas Whitley's generosity. Tom is a member and official popper of this family-owned business.. Tom popped a fresh kettle of corn for us and gave us a bag. This food vendor is a locally owned business here in Garland. They are located at 3352 Broadway Blvd. Suite 513- Garland 75043. Call Tom at 214-388-8973 and schedule him for your event or fundraiser. Next month I will buy one of the delicious-looking pecan pies from this food vendor. Jami's slogan is "For Some It's about the filling--For others it's about the crust--For us it's both. If you can't wait until next month for the taste of what looks like a delicious homemade pecan pie call Jami's at 214-704-3831. Jami has some stiff competition. Another local food vendor and friend of mine, Delores Elder Jones of D's Delectables, makes the best pecan pie I've ever eaten thus far in my life. 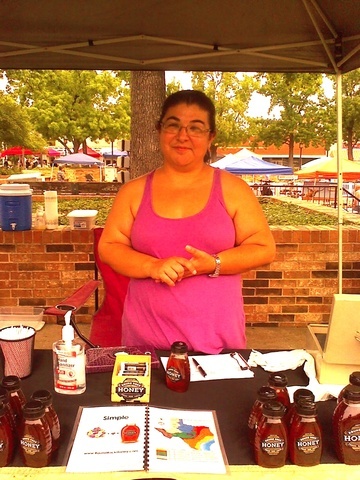 Melyssa Childs-Wiley, owner of Fat Lady Foods make delicious jams. Like most of the vendors here at Garland Marketplace, Melyssa purchases the goods (that she doesn't grow herself) from local folks. As for her commercial kitchen, she goes to the Hour Kitchen right here in Garland where she lives. 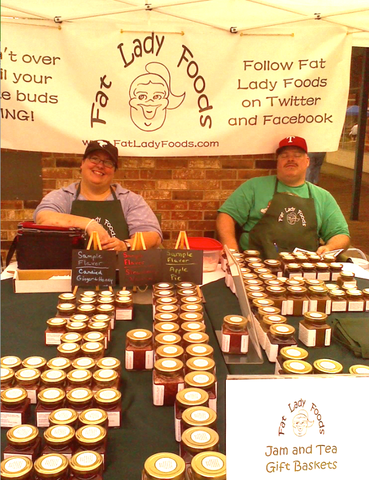 If you are looking for some fantastic jam, give Fat Lady Foods a try. When you do, remember that when you buy local, more of the money you spend is recirculated in your local economy than when you don't. 469-744-5700. Melyssa is so local that I can even walk over to her house at 205 Faircrest Drive- Garland 75040. I predict that someone is going to want to support Stephanie big time with her business. Like Melyssa, and most local entrepreneurs, Stephanie also uses local sources for her supplies. Her food products are all pickle-based and quite interesting combinations. For example, she makes sweet and savory, "guilt-free" dessert pickles. featuring: Caramel English Toffee, Dutch Chocolate, French Vanilla Ice Cream, Banana Cream Pie, Cheesecake and Peach Cobbler. She makes beverage pickles such as Pina Colada and Hurricane Rum. She makes fruity pickles such as strawberry and grape. She makes spicy pickles. There is no end in sight to the variety of pic-licious pickles as there is no end to Stephanie's imagination. However she did tell me that some of her experiments don't turn out to be pic-licious and thus don't get introduced into her product line. The sample I had was a chocolate pickled cucumber. I know, it sounds awful, but guess what--it was pic-licious. I asked Stephanie how she got started in this business. She told me that she had a relative who pickled just about everything under the sun. 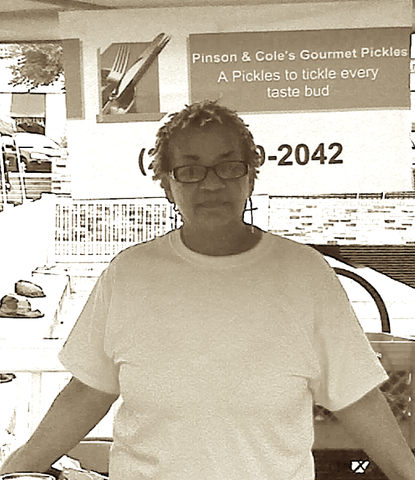 Indeed, as Stephanie says at her site, Pic-licious, her pickles will add a new twist to any meal. To contact her directly, call her at 214-670-2042 or you can write to her at stephaniepcole@yahoo.com . Last fall David purchased a green house and assembled it in his backyard. From there he has followed his ambition to propagate tropical plants such as passion flower and plumeria. He had somewhere in the neighborhood of 100 plants for sale at his booth. Who knows where this newly started venture will end. Perhaps he will sell to florist shops eventually and/or perhaps garden stores such as our own local Rohdes. Perhaps he will become a wholesale florist. If you think passion flowers are cheap--think again. FTD florists charge $124 a bouquet for them. "If you treat your dog like a princess with Phideaux Cuisine, you'll never have a mutt." 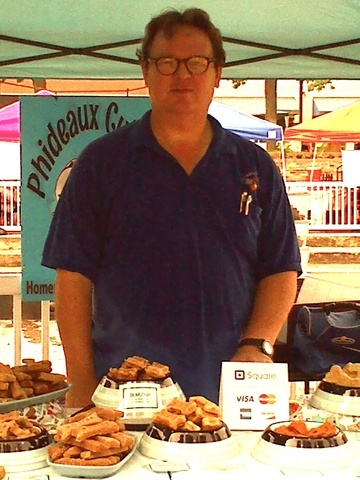 We met Roger, one of the owners of Phideaux Cuisine. He and his partner of 19 years, Chuck, grew their gourmet pet treat business out of their mutual love of animals. Here is an example of the ingredients for one of their products: Buddylicious Cake Dog Treats: Brown rice, applesauce, powdered milk, vegetable oil, eggs, parsley and cinnamon. They are located in Royse City TX 75189. Visit their website at Phideaux Cuisine. Free Spirit Creations was there with their awesome eco friendly products. This locally based company sells their great soaps and candles at numerous locations throughout the DFW area. 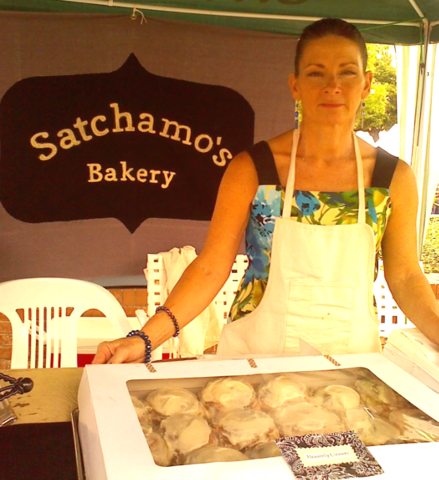 Satchamo's Bakery is new to the DFW scene and if their baked goods tastes as good as they look. . . . Satchamo's is nearly new and did not have business cards yet to hand out. Yea! Another new local business. From their website: "InHome Wholisticare and Wellness, locally owned by two sisters and a life-long friend, have over forty-five years of combined experience in healthcare. In 2011, Cecilia Mitchell retired from a successful career as a Physical Therapist and home health care company owner. After experiencing the challenges of our current healthcare system and her own healthcare challenges, it became clear to Cecilia that prevention of disease and management of health challenges through WELLNESS was the key to well-being." "Equipped with her extensive knowledge of nutrition, exercise, and healthcare, Cecilia had a vision of integrating these skills to create a private duty homecare company that provides compassionate care with a focus on the whole person and that promoted independence through WELLNESS." They featured tasty samples of some of the food they prepare for their clients. As you can tell from their beautiful smiles, they exude health and kindness. Who wouldn't love to have them in their homes taking care of a loved one? 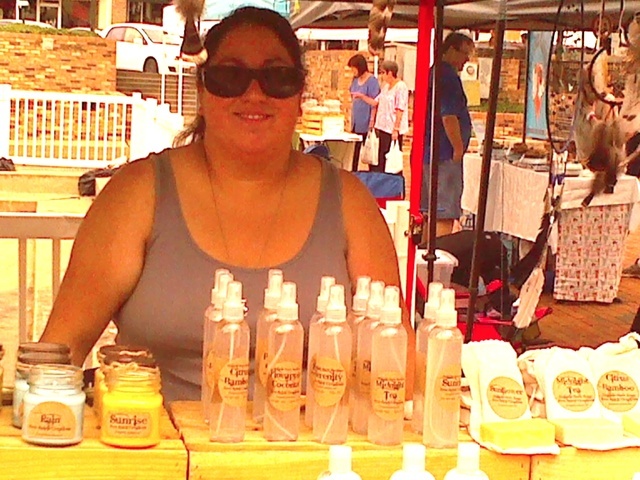 The Round Rock Honey Company was well-represented. Visit their website to learn more about the Texas honey company. South Texas Beef Jerky -- Daryl Haynes makes some great beef jerky. I especially like his habanero pepper beef jerky. Charlie bought two bags. Next month I will certainly purchase one of the aged Balsamic Vinegars from this vendor as I'm addicted to french bread dipped in a good balsamic vinegar. I hope he returns in July. Tjernlund Goat Farm from Grand Saline, TX. They make all natural goat milk soaps. Their bars contain at least 25% goat milk. In case you don't know it, goat milk slows down the skin aging process, retains skin moisture and rebuilds skin cells. They currently have 29 goats on their farm. I invited them to Loving Garland Green's Midsummer Nights Garden Tour, but they had to get home to milk their goats. People are waking up to the tremendous economic potential behind a local plant-based economy. Certainly the vendors at the Garland Marketplace seem to have caught on to the possibilities offered by such an economy as opposed to the unmanageable international economy that has in essence abandoned Main Street. As more people grow at least some of their own food, we will see more and more of this shift over to a local, plant-based economy. Urban gardeners generate new markets and support existing markets--all forming a stronger, more resilient local economy--one that is not at the mercy of national and international economic trends. Let's get out and support these people. In fact, let's become one of them! By working together and getting to know and support our neighbors, local people can and will rebuild our local economy. In closing, we all need to remember there is more to value than the price of an item. Some folks complain the price of handmade items are more expensive than commercially produced goods. This is true. However, there are other benefits we derive from purchasing locally-made goods that are not readily apparent. Most local urban farmers and artisans support a whole network of local businesses. Many of the people I chatted with yesterday emphasized to me they used local businesses as their suppliers. This is why so much more of the money we give for the purchase of goods from a locally-owned business stays in our community and enriches all of us by strengthening our local economy. This is not to say we don't need and shouldn't support chain stores. However two points on that issue: 1) Spread it around by supporting locals too. In fact you might even be surprised when it comes to prices as I sometimes find better deals on plants at Rohdes and Roaches than I do at their chain store competitors. And 2) When you do shop at a chain, shop at one that is located in your city. For example, if you live in Garland and shop in Sachse, 2% of any Texas sales tax you may pay on goods purchased goes to Sachse, not Garland. NOTE: I apologize to many other vendors who are not mentioned in this article, but as I mentioned, this was a whirlwind tour as Charlie and I had a wedding to attend and were also each hosting a garden tour at our homes later that evening. We didn't stop at any of the vendors who were not promoting food or plant-based items. You'll have to go and see for yourself on Saturday, July 19 (the third Saturday of the month). We will stop at those booth too and visit with those vendors. 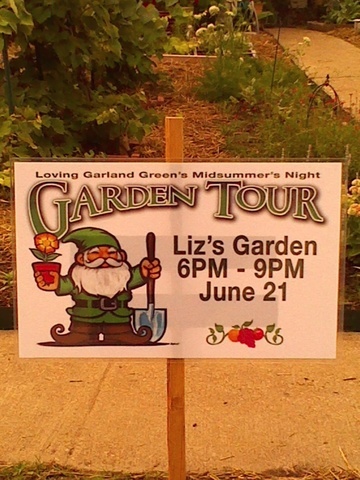 I hope you will be able to come out tonight and meet me and my garden--along with 6 other gardens featured on Loving Garland Green's first annual Midsummer's NIght Garden Tour. I would love to meet you and talk garden. The maps are almost finished. Later this afternoon they will be featured on the homepage of Loving Garland Green and a few of them will be available tomorrow at Garland merchants. Also, on Saturday morning members of Loving Garland Green will be handing them out at the downtown Garland Marketplace. You can start your celebration for the beginning of summer early while the produce and other goods at the market are still fresh. I would begin the tour with Daniel and Carol's garden at 2514 Diamond Oaks Drive- Garland 75044. Their front yard is all garden and is quite a treat to see. From there go to Bob Phillips garden which is located at 3510 Colbath- Garland 75040. Bob is a master gardener and his front yard looks like a florist shop. After viewing Bob's garden, move on the Robert and Anita's garden which is featured at 3221 Kingswood Drive - Garland 75040. I really like their garden because they don't have a fence in their back yard. The openness of it is quite lovely. From their garden of monster veggies, travel on over to 211 East Kingsbridge where you can see Margie and Gene's fantastic garden. I would park my car on Kingsbridge and walk to the rest of the gardens. 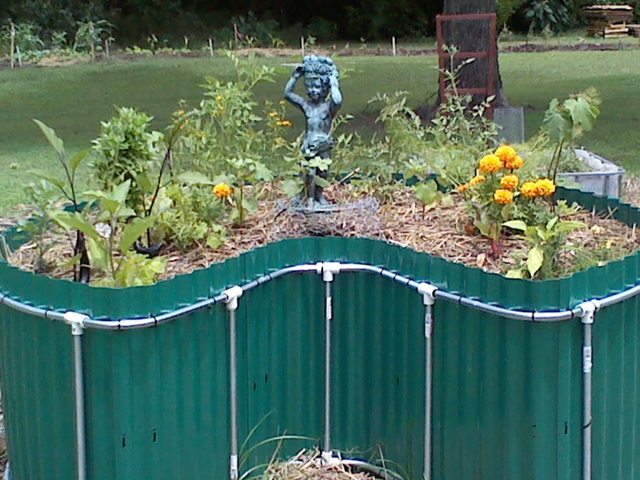 In addition to Margie and Gene's plants and flowers, be sure to look at all their handiwork which includes yard art designed by Margie and special garden tools built by Gene such as a composter and a self-watering planter. From Margie and Gene's, walk across the street to my garden at 216 East Kingsbridge Drive. You can't miss my garden because it is planted in my front yard and features a variety of mostly edibles--from artichokes to zucchini. You will also have the opportunity to view the monster blackberry bushes and see the two that have produced over 10 pounds of blackberries this season. After looking at my garden, there will be arrow signs directing you down the alley to Charlie's place (two houses down). Charlie's street address is 269 Bellwood Drive, but on foot, the alley is the fastest route. Besides, Charlie's garden is out back. He has raised beds surrounding his swimming pool. Of all the gardens I've visited so far this year, Charlie's has the most and the tastiest tomatoes. Charlie is also giving away seeds from his prolific brussels sprout plants. As a grand finale, end the tour at 4022 Naaman School Road which is the location of the Garland Community Garden--the first community garden in Garland built on City property. The Winding Garden is an approximate four feet wide and 170 feet long garden. This garden space is created following a method of raised bed development often called the "Lasagna Raised Bed." To create these types of beds use cardboard, leaves and organic matter to create alternating layers. Use two parts carbon or brown matter (dry leaves, small branches, cardboard) to one part green matter (green leaves and even vegetable scraps). Many alternating layers that are heavily watered is the key to success. Some even sprinkle a little garden soil every so often during the layering process. The bed should be about 10 inches high when complete. Mix about four inches of garden soil with compost and spread on the top of the bed. 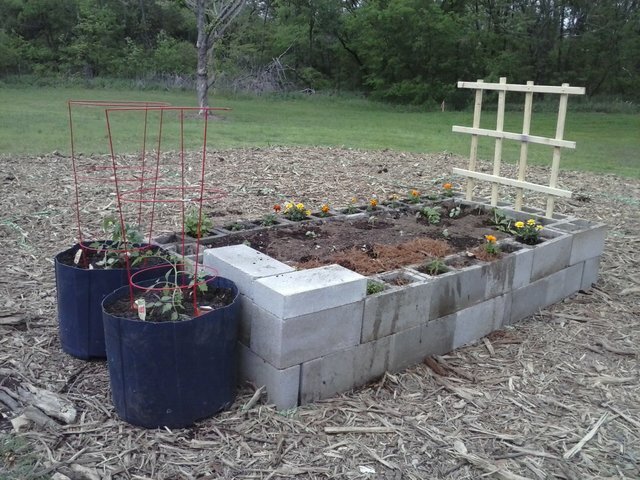 Personally, I am turning toward the lasagna method of building raised beds. 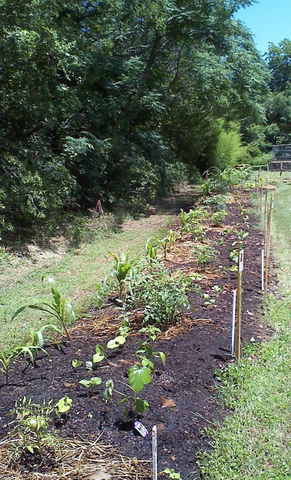 This method follows closely the method for constructing raised beds that was advocated by Ruth Stout for years. She never tilled the soil in her gardens. She never fertilized. Instead, she just kept piling mulch (usually hay and vegetable scraps on top of the beds. She would even sow seeds in the mulch. She claimed (and her plants proved it) the decaying organic matter was all the fertilizer needed. She also claimed that her gardens required little to no water. (But we have to remember that she lived in New England.) Of course, it is no surprise that she came to be known as "the mulch queen." Ms. Stout lived well into her 90's and wrote several organic gardening books. Be sure to notice the feeder baskets that we've inserted into the soil in many of the beds. These baskets are cylinders fashioned by hand from chicken wire and sticks. The basket is inserted about 10 inches down into the bed. A mixture of vegetable scraps, coffee grounds and cardboard are put into the baskets--just about any non-animal organic matter except for citrus which worms tend to reject. The baskets are watered to facilitate the decay process. Roots of the plants are attracted to the basket for nourishment. 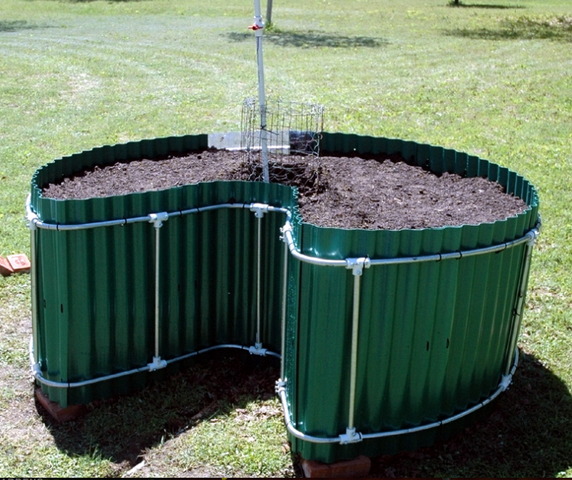 Some claim this method can reduce the need for water by up to 50%. The Winding Garden April 29, 2014. The Winding Garden June 8, 2014, about six weeks later. 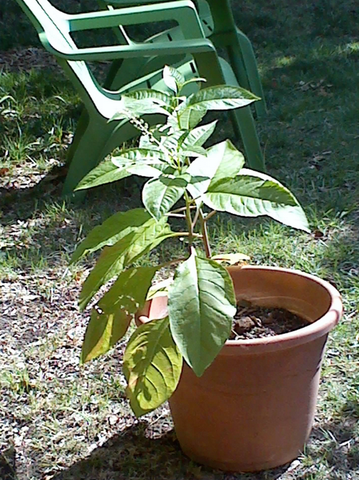 About six weeks ago a plant appeared in an empty pot in my back yard. Margie identified it as a "Polkweed". She told me the leaves can be eaten if you boil them three times, pouring off the water each time and replenishing with fresh water. According to Margie, some people enjoy eating the leaves mixed with scrambled eggs. According to Wiki: "Phytolacca americana (pokeweed) is used as a folk medicine and as food, although all parts of it must be considered toxic unless, as folk recipes claim, it is "properly prepared". The root is never eaten and cannot be made edible. Berries are toxic when raw but cooked juice is reportedly potable, whereas the seeds are supposed to remain toxic after cooking. Pokeberry juice is added to other juices for jelly by those who believe it can relieve the pain of arthritis. In a traditional Cherokee recipe for fried poke stalks, young stalks are harvested while still tender, peeled to remove most of the toxin, washed, then cut into pieces and fried like okra with cornmeal. Young pokeweed leaves boiled three times to reduce the toxin, discarding the water after each boiling, results in "poke salit" or "poke salad" or "poke sallet" and is occasionally available commercially. Many authorities advise against eating pokeweed even after thrice boiling, as traces of the toxin may still remain. All agree pokeweed should never be eaten uncooked. Since pioneer times pokeweed has been used as a folk remedy to treat many ailments. Dried berries were ingested whole as a treatment for boils, taken one berry per day for seven days Grated pokeroot was used by Native Americans as a poultice to treat inflammations and rashes of the breast Independent researchers are investigating phytolacca's use in treating AIDS and cancer patients. . . ."
According to most sources, pokeweed is an easily grown plant, succeeding in most soils and full sun or partial shade. The stout erect stalk is tall, growing to 10 feet or more, smooth and branching, turning deep red or purple as the berries ripen and the plant matures. The root is conical, large and fleshy, covered with a thin brown bark. Leaves are about 5 inches long and 2 to 3 inches wide, simple, alternate, ovate-lanceolate, and smooth. The flowers which appear from July to September are long-stalked clusters and each has 5 whitish petals with green centers. The fruit is a rich deep purple round berry, containing a rich crimson juice. Other research on pokeweed revealed the root is alterative, anodyne, anti-inflammatory, cathartic, expectorant, hypnotic, narcotic and purgative. It is used in the treatment of rheumatoid arthritis, tonsillitis, mumps, glandular fever and other complaints involving swollen glands, chronic catarrh, bronchitis and diseases related to a compromised immune system it has potential as an anti-AIDS drug. Some of the chemical constituents in the plant are triterpenoid saponins, lectins, antiviral proteins and many phytolaccagenic acids, which are not completely understood. 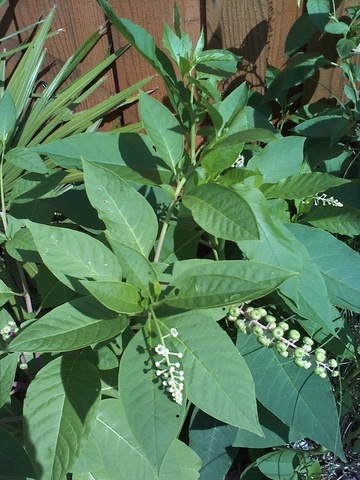 New research has revealed that a possible CURE for Childhood Leukemia called (B43-PAP) is found in the common Pokeweed. Anti-B43-pokeweed antiviral protein, B43-PAP, PAP is a pokeweed toxin. The B43 carries the weapon--the PAP--to the leukemia cells. It has been touted as a smart weapon. In one study 15 out of 18 children who had participated had attained remission. The following is part of a repot from Parker Hughes Institute: The two parts of this drug are the B43 antibody (or anti-CD19) and the pokeweed antiviral protein (PAP) immunotoxin, a natural product in the pokeweed plant. B43 is designed to recognize specific B-cell leukemia cells just as natural antibodies attack and recognize germs. When the antibody finds a leukemia cell, it attaches and B43 delivers the other part of the drug, PAP. Inside the cell, PAP is released by the antibody and inactivates the ribosomes that make the proteins the cell needs to survive. With the cell unable to produce proteins, the specific leukemia cell is killed. More than 100 patients have been treated with B43-PAP and shown only minimal side effects. Caution is advised as the whole plant, but especially the berries, is poisonous raw, causing vomiting and diarrhea. In 1970 Tony Joe White wrote a song titled Polk Salad Annie. This brings another question to the forefront: Some sources refer to the plant as "polkweed" and other sources call it "pokeweed". I wonder why? 'Cause thats about all they had to eat, but they did all right . . . "
Since it grows all over the DFW area, it's somewhat comforting to know that those of us who live in this area may never have to go hungry. The other day when I was over at Charlies' I saw several large pokeweed plants in his front yard. Charlie says he won't even try to eat any, but I think I will. Who knows? Perhaps someday we might be glad to have pokeweed to eat. I may as well develop a taste for it now. Please join us Saturday June 21st for our Midsummer Night's Dream Garden Tour from 6PM to 9PM. It's free and open to the public. Maps will be available by Wednesday, but if you can't find one, go to 211 East Kingsbridge Drive at 6PM on the 21st. You can start the tour there and Margie and Gene will tell you where to go next. This morning I went down to the garden to check on things and to water some perennial transplants I installed a few days ago. Naturally I had to inspect the entire garden. To my surprise, the concrete block garden actually had some produce: radishes, yellow squash, a cucumber, radishes and a zucchini. 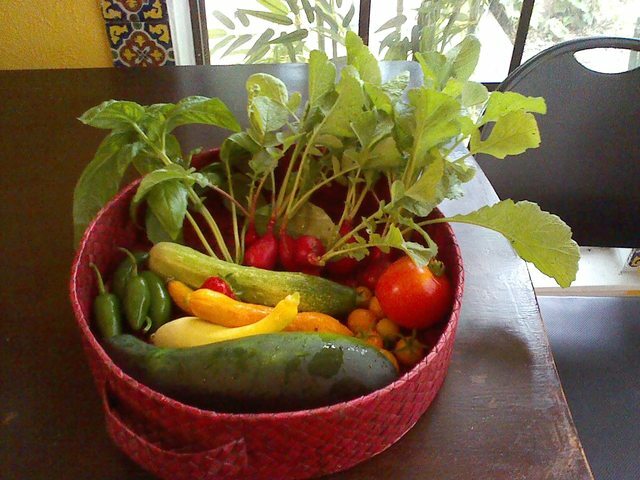 Inspired, I searched the rest of the garden and came up with one large red tomato from the square foot garden, three or four jalapeno peppers and lots of yellow tomatoes from the winding garden area. I went home and picked some greens, a few blueberries, blackberries and strawberries and a little bouquet of roses, rosemary, mint and tarragon. The photo below shows the washed greens along with the vegetables. 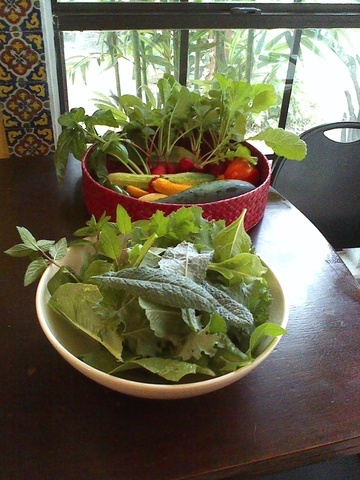 The greens came from my garden. I put the produce in baggies and took it along with the bouquet to the Good Samaritans house here in Garland. The Good Samaritans are a local nonprofit whose members are dedicated to preventing homelessness and hunger in our community. The fresh food I brought to the Good Samaritans today was enough for two great salads (tomatoes, cucumber, greens, basil and radishes); a vegetable stir-fry for two with yellow squash, zucchini and jalapeno peppers; and one serving of blackberries, strawberries and blueberries. Now, just think: What if next week everyone in Garland with a garden shares some of their bounty with one of our local food banks? How much would that be? Quite a lot of fresh meals is my guess. No doubt such a little effort from so many would result in several hundred pounds of fresh food. It's good to take pictures and then review them from time to time. Once in a while I slump into the pit of negativity thinking thoughts along the lines of " . . . What does it matter? It's too much work for such meager returns. Nothing seems to be growing. We will never get there. etc." By accident the other night I was cleaning the photos off my desktop and I came across some that I had taken a couple of months ago during the installation of the concrete block bed down at the garden. Wow! I had forgotten how far we have come. These concrete blocks were in my back yard. It was the first raised bed I ever built. Unfortunately it was in my back yard which is filled with trees and no sunlight so nothing grew in it last year. At one of our meetings this year I donated the blocks to Cary and Regina, members of Loving Garland Green. In fact, Cary is now an officer of our board. 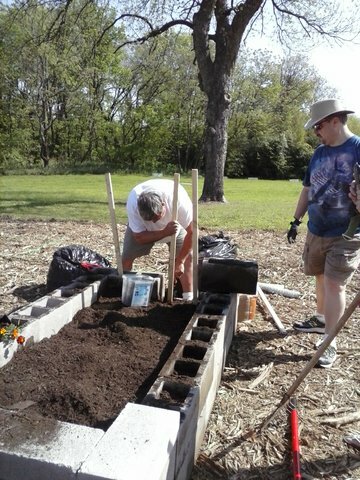 We later decided to install the bed at the Garland Community Garden and thus it became the second bed we installed there. Below we have Charlie and Cary building the trellis for the concrete garden in late April. Below is a shot of the garden only a few days after its build. 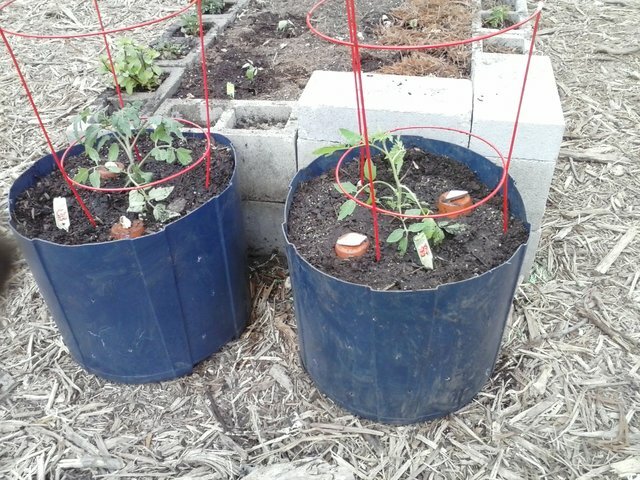 I brought down two heirloom tomato plants and put them in front of the concrete blocks to reduce the tacky factor--ironically I overlooked the fact they were planted in recycled trash bins which aren't themselves all that attractive either. Below is a closeup of the tomatoes as they looked when first planted the end of April. Each pot has two ollas for water conservation. 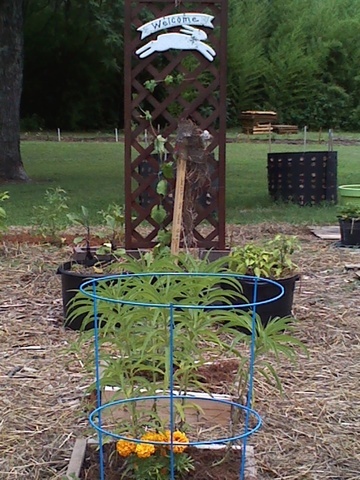 Below is a photo of the tomatoes today six weeks later. The plant on the left is loaded with large heirloom Roma tomatoes. 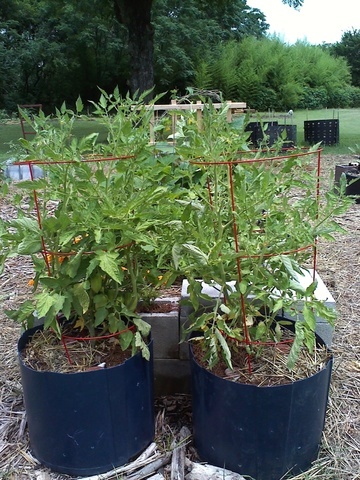 The one on the right is loaded with heirloom tomatoes that were especially developed for our hot dry summers. Robert Opel (a photographer, artist and member of Loving Garland Green) just sent me a couple of photographs he took of my garden after our meeting on Monday. 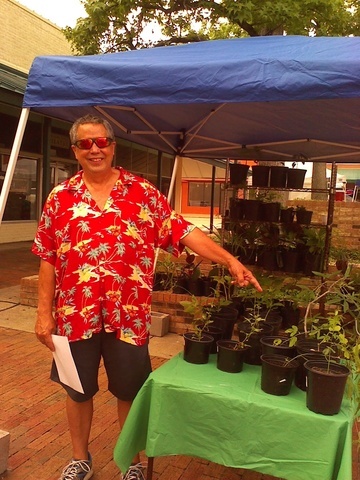 Robert is also the member who is creating the map for our garden tour scheduled for Saturday, June 21 from 6PM to 9PM. I can hardly wait to see the map. The first photo shows a rose bush from my garden. It is one of those bushes that are adapted especially for Texas. I put it in last year in July and it bloomed from July all the way up to the second week of November. Already this year it has been blooming since late April. The second photo below is of yarrow that I planted last year from seed. It never came up last year so I assumed the seed was a dud. Then this spring, here it came in full force. 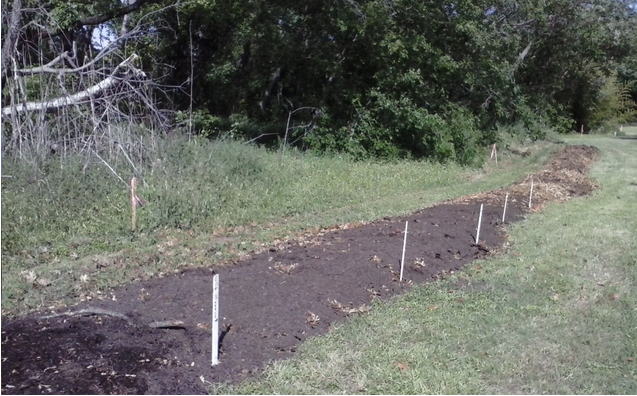 I've transplanted several clumps of it to other places in my yard as well as some down to the Garland Community Garden. Yarrow has long been an herb associated with magic. Its formal name, Achillea millefolium, refers to Achilles who is reputed to have used the herb to heal his wounds of battle. Yarrow has also long been a symbol for lasting love as well as an herb that is beneficial in warding off the devil. It usually takes a year or two to establish itself in the garden, but once there it is a hardy perennial that comes back year after year. It comes in several colors--yellow, orange and white. Mine is white. One great thing about belonging to a community group like Loving Garland Green is that you have the opportunity to make a lot of really nice friends. Gardens and garden activities are social events that bring people and communities together. Yesterday Charlie and I were on our way home from lunch at a Garland restaurant, Thai Jasmine (which I highly recommend) when we noticed Margie and Gene's mowing tractor at the garden unattended. Curious, I stopped in at their home which is right across the street from mine to inquire regarding the abandoned tractor. Turned out that it had run out of gas and Gene went to get more gas. As long as Margie was down there, I decided to return and give an extra drink to all the transplants that we had installed the day before. Note: The ceramic "flower" plate is an example of yard art created by Joan Stewart. If you are interested in trying you own hand at these creations, you can find the complete instructions here: http://www.business2community.com/travel-leisure/how-to-make-inexpensive-flower-plate-garden-art-0215241#!XTPm4. 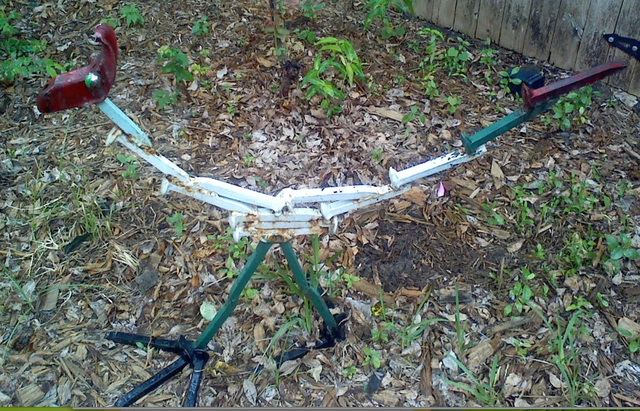 Speaking of yard art, here is an example from my yard: a road runner fashioned from railroad spikes. Visitors to Loving Garland Green's Midsummer Night's Dream Garden Tour are in for a real treat when they tour Margie and Gene's garden. 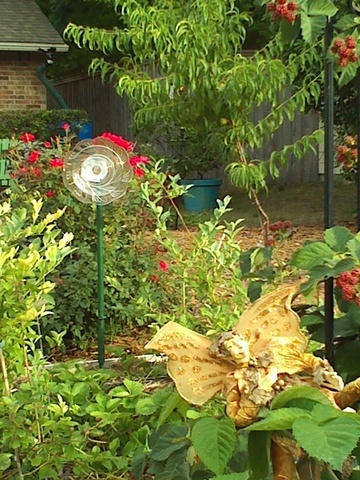 In addition to the plants themselves, Margie and Gene have a plethora of yard art they have collected over the years. Be prepared for plenty of frogs as they are among Margie's favorite types of yard art. It's hard to know what Margie has more of: garden hats, garden gloves, or frog yard art. Mark your Calendars for June 21st--Summer Solstice, Longest Day of the Year! 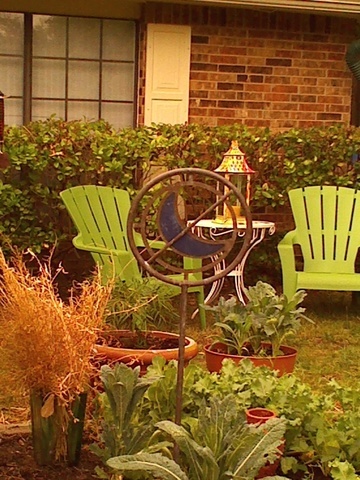 Celebrate the light by attending Loving Garland Green's Midsummer Night's Dream Garden Tour 6PM to 9PM. It's free and open to the public. If you don't know where to go, start the tour at 211 Kingsbridge Drive. Margie and Gene will tell you where to go from there. We will have maps published next week available for download. 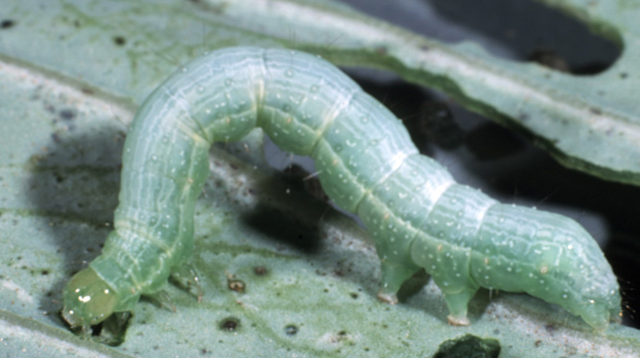 Cabbage Worms and the Ecosystem--Where do our priorities fit? This morning Charlie announced that indeed worms (larva forms of the cabbage white butterfly actually) are feeding on his cabbage. Always horrified that Charlie might resort to a chemical pesticide, I quickly ran to the computer and looked up organic remedies for cabbage worms. On numerous sites throughout the internet I read: ". . .sprinkling corn meal, rye flower or a mixture or 1 part salt to 2 part flour on damp leaves will kill the worms. After they eat corn meal they will bloat and die." In addition, readers are cautioned to dust the underside of the leaves as well. Thus, this morning we sprinkled the cabbage plants liberally with corn meal. In addition, I went home an sprinkled several of my plants with corn meal too. My eggplants, strawberries, rhubarb, and four o'clocks all have some holes in their leaves. I'll post next week regarding the results. "Butterflies and moths play an important role in the natural ecosystem as pollinators and as food in the food chain; conversely, their larva are considered very problematic to vegetation in agriculture, as their main source of food is often live plant matter. In many species, the female may produce anywhere from 200 to 600 eggs, while in others the number may go as high as 30,000 eggs in one day. The caterpillars hatching from these eggs can cause damage to large quantities of crops. Many moth and butterfly species are of economic interest by virtue of their role as pollinators and the silk they produce ." Once again we are back to an old dilemma similar to answering the question of which came first--the chicken or the egg? Do we destroy pests that eat our crops or do we allow them to munch on our food and then cut away the good parts that are left for ourselves? Just where do we draw the line at protecting our ecosystem for ourselves and for future generations? This is indeed a serious question. Even though Charlie and I used a nontoxic -to-humans substance, we still messed with the balance of the ecosystem this morning. However, another way to look at this issue is that Charlie and I messed with the natural ecosystem to begin with by planting transplants and seeds to create our gardens. 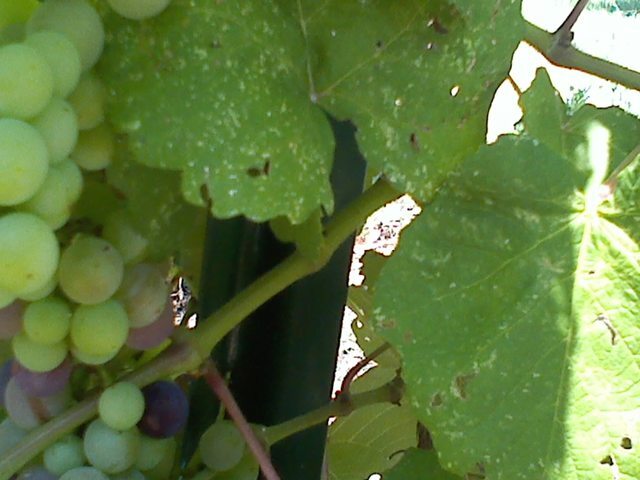 Notice the one purple grape in the cluster above. Perhaps some of the bunches will be ready to offer to visitors who stop by my garden on the Midsummer Night's Garden Tour a week from this Saturday on June 21 from 6PM to 9PM. When the grapes first appeared on my vines this year I noted with some disappointment they were green. I much prefer the richer flavor of the red to deep purple grapes. I purchased the vines at the tail-end of the season in August of 2013 at Bruce Miller Nursery in Richardson. (Yes, I looked at all the local nurseries first but they had none.) My memory is that I had purchased Concord grapes as I really like to eat them. Green grapes are OK too, but not as good in my opinion as the Concords for eating. This morning, when I was feeding my garden and dusting some plants with corn meal, I noticed that some of the grapes on my vine are changing to what promises to eventually be the deep purple of Concord grapes. Come to think of it, I don't expect tomatoes to stay green. I'm not sure why I thought the grapes would be green. Some people lament the fact they don't know it all. There are those who even berate themselves for not knowing it all and for not being able to answer every question correctly. However, I rather enjoy the fact that I don't know everything because that leaves room for the thrill and fun that comes with learning and discovery. For example, if I already knew everything, I would have already known that grapes all begin green. Thus, seeing the purple grapes on my vine today would have been just another ho-hum experience. And that's the thing I love about my garden: every day it teaches me something by gently nudging me in the direction of learning more.